COLUMBUS, Ohio (AP) — Ohio State coach Urban Meyer’s current suspension and previous paid leave have restricted him from talking football with his staff and athletes during August with one exception — a team meeting the day after the suspension was announced. Meyer and athletic director Gene Smith were allowed to meet with the players and coaches for about 45 minutes last Thursday, according to emails sent to Meyer by the senior vice president for human resources, Susan Basso. 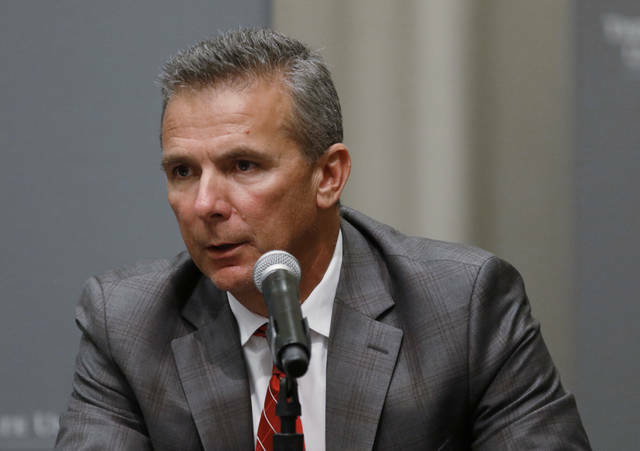 The emails outlining the details of Meyer’s suspension were obtained by The Associated Press on Tuesday through an open records request and first reported by Ohio State’s campus newspaper, The Lantern. Meyer can’t attend practices, meetings or official events, and can’t conduct any business related to being head coach. Meyer and Smith were suspended over their handling of a now-fired assistant coach who was accused of domestic violence. Meyer resumes some coaching duties Monday but can’t coach during the first three games. He will be allowed to run practices after the team’s first game. Meyer and athletic director Gene Smith met with the team on Thursday. Meyer received written details of the suspension on Sunday, four days after the discipline was announced publicly. At 5:53 p.m. Monday, Meyer was sent an email from Basso confirming that the Thursday meeting — “in order to apologize to the team” — had been authorized. Meyer’s sideline substitute for the first three games will be 39-year-old co-offensive coordinator/quarterbacks coach Ryan Day, a second-year Ohio State assistant who has never before been a head coach but has been filling in while Meyer is out. The suspensions followed a two-week investigation that found Meyer and the athletic director mismanaged now-fired assistant coach Zach Smith, who was accused of domestic violence and other problematic behavior. Zach Smith — the grandson of former Ohio State coach and Meyer mentor Earle Bruce — has denied being aggressive with his ex-wife. Meyer eventually acknowledged he was aware of domestic violence allegations from 2015 but didn’t fire Zach Smith until July 24, after his ex-wife was granted a domestic protection order. Because Zach Smith wasn’t arrested for domestic violence in 2015, neither Meyer nor athletic director Gene Smith believed they were obligated to report it to university officials. 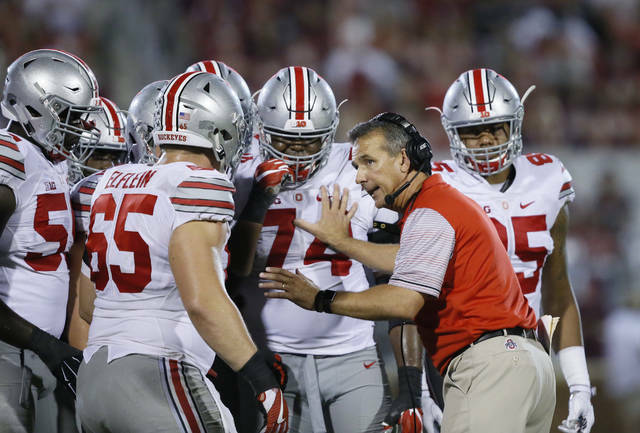 On Monday, Ohio State defensive coordinator Greg Schiano described his contact with Meyer. Columbus, OH (August 30, 2018) – This Saturday, BBB encourages Buckeye fans to have fun, cheer loudly and park carefully. During football season, campus parking is at a premium, with many folks driving from afar to support the Buckeyes. Towing is currently a big issue, especially when there are often more cars than available parking spots. Drivers are often surprised when their car is towed after only being left for a couple of minutes. In the past, complainants have reported to BBB that they parked, walked to the nearest ATM, and returned to their car being towed in the short amount of time they were gone. Typically, towing companies respond to BBB saying the drivers left the lot and ignored the signs warning against illegal parking. Ohio’s regulations were updated in recent years to prevent consumer towing abuse. For example, for any vehicle under 10,000 pounds, the maximum towing fee is $90.00, and the maximum storage fee is $12.00 per day. The regulations also explain sign requirements for properties that enforce towing and outlines other rules that towing services must follow. • Know the Ohio Revised Code Section 4531.601 Private tow-away zones. Keep a copy in your car’s glove box so that you can easily refer to the maximum amount allowed for towing fees and other towing restrictions. • Do not park illegally, even for a short amount of time. If you think you may be parking illegally, simply move elsewhere. Walking an extra block will be worth the potential towing fees. • Park in a lot where you know your vehicle will be safe instead of risking parking on a side street or on private property. Private lots will have signs that you can carefully read stating their parking rules. • Even if you do not see a tow truck, someone could see you. Tow truck companies will often pay “spotters” to watch the lot and call them if they see a car owner park and leave their vehicle in the lot. • Do not let your vehicle’s tags expire. Make sure that your tags are up to date! • If you have a dispute with a towing company on private property, the police cannot help you. If you are on public property, such as a city street, then the police may be able to help you if you believe that the towing company is violating the law. For more information, follow your BBB on Facebook, Twitter, and at bbb.org. For more than 100 years, Better Business Bureau has been helping people find businesses, brands and charities they can trust. In 2017, people turned to BBB more than 160 million times for BBB Business Profiles on more than 5.2 million businesses and Charity Reports on 11,000 charities, all available for free at bbb.org. There are local, independent BBBs across the United States, Canada and Mexico, including BBB Serving Central Ohio, which was founded in 1921 and serves 21 counties in Central Ohio.